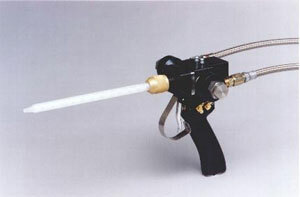 Available in both a standard shut off or snuffback model, the 400 Series Autoguns are used in combination with our line of Meter/Mix and Dispense systems for mixing plural component reactive materials. This would include epoxies, urethanes, and silicones. Their unique design allows high flow and minimal maintenance. If cross contamination should occur, the manifold can easily be removed and cleaned without disassembly of the valve body. Inline check valve/swivels are used at the inlet ports to provide backflow protection as well as freedom of movement. A wide range of peripheral items are available to enhance the operation of our valves, including electro/pneumatic controls, stands, and other control and fixturing devices. Our engineers are always available to assist you in choosing the right valve for your application. Sheepscot Machine Works, 1130 U.S. Rt. 1, Newcastle, ME 04553. Tel: 207-563-2299; Fax: 207-563-2619.